I have always loved cats. I've had them as pets since I was child, and currently have two. I like their independence. Cats don't need me, but like to be with me. I like that I can be gone overnight, and know that the cat won't starve to death, or tear up the furniture. Cats are quiet, for the most part, so I don't have to worry about them bothering the neighbors. Cats don't normally bite people, unless they are being bothered or are in a grumpy mood. All in all, cats are the best pets for me. But I also have a dog now. My husband wanted one for several years, and I always came up with excuses why we shouldn't have one. However, I relented when my husband became disabled. Our dog's name is Charlie Watts, named after the drummer of the Rolling Stones. He was such a cute young puppy when we first got him, and quite a delight! I couldn't help but fall in love with him! If you were to ask me today, I will still say I am a cat person. 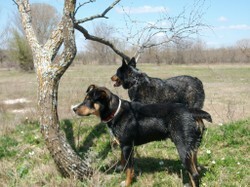 But you can't go wrong with a dog, and this article provides the reasons why. A dog is the best pet for me! #1 - A dog is always glad to see you. No matter how long you've been away, a dog is always happy to see you when you return. Your dog will greet you with enthusiasm and unconditional love. When I come home, Charlie is sitting at the gate, patiently waiting for my return. He jumps up and down, and follows my truck up the drive. Unlike my cat, who is asleep on the bed, and quite indifferent to my arrival. #2 - A dog needs exercise, and so do you! If it wasn't for my dog, I'd probably be 50 pounds heavier! Because he is so active, we take long walks in the pasture. He likes to swim, and the stock tank is about 1/2 mile away. I throw balls and sticks for him, and chase him around the yard. There are days when I just don't feel like getting out, much less exercising, but knowing that Charlie needs to burn energy gets me up and going. be persuaded to go for a walk." Charlie is a big dog, so he needs big toys! He has torn up tennis balls, socks and frisbees. I knew when he started carrying around logs, that it was time to get him a heavy-duty, durable toy! 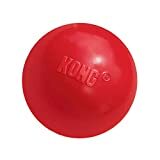 The Kong line of dog products are really great! I purchased Charlie Watt's first Kong ball over a year ago, and he still hasn't destroyed it. We play with it at least 5 times a week, and it is still intact. All other products that I have purchased lasted a day or less. If you have a big dog that likes to play, this is a great toy! Dogs are very sensitive, and know when you are stressed, sad or ill. While they will commiserate with you for awhile, they also teach you to move on. This is because while dogs have really good memories, they also get past things quicker than humans. When my husband came home for hospice care, Charlie laid beneath my husband's bed the entire time. He knew something was wrong. After my husband passed away, Charlie mourned his loss as much as I. He always seems to know when it's okay to be rambunctious, or when it's best to stay quiet at my feet. A dog is a built-in burglar alarm. If someone stops at our gate, Charlie will begin barking. He will hear them even when I do not. Strangers who do not know Charlie are unsure as to whether he will attack, so they normally will not come past the gate without my permission. useful than a sleeping lion." #5 - A dog provides companionship. Living in a rural area, days can pass without seeing other people. Charlie keeps me from being lonely now that my husband is gone. A dog will always be there for you. Charlie will listen when I want to talk, or work with me in the yard. When you have a dog, you are never alone. #6 - A dog will make you laugh. Dogs are do all sorts of silly things. It is difficult not to smile and laugh at their antics, even when you are not in a good mood. Laughter is healthy - it boosts your immune system, and helps ward off depression. Charlie loves to hide his head under a towel and pretend that he is invisible. I laugh because the rest of his body is showing. He likes to lick the cat's face every morning, and always gets swatted. I laugh because it's as if he doesn't remember the outcome. I was really amused the first time he encountered ice on the stock pond. Boy, was he surprised when he slid across the surface! Charlie always makes me smile, even when I'm sad. I'm a cat AND dog lover now! Having a dog is not fun and games all the time, and occasionally I get irritated with Charlie Watts when I'm trying to work. He does need a lot of attention, and sometimes I just don't have enough time to play. I've kidded with my friends several times, saying "Please, take my dog with you when you leave!" However, I wouldn't trade Charlie Watts for a million dollars! He is my friend, my companion, and my protector. And most importantly, we share a great love for each other. I am thankful every day that he is a part of my life! Do you know of any other reasons a dog is a good pet or companion?